Taking the awwww approach to earn your affection, Sony is staking a claim in the crowded compact Bluetooth speaker market with its adorable new SRS-BTV5. At roughly the size of a billiard ball, what the 1.2-watt speaker lacks in oomph, it makes up for with functionality. It wirelessly connects to any Bluetooth A2DP compatible audio device, and Sony has added NFC functionality to further simplify the pairing process. Streaming your tunes is just a simple tap away. A built-in mic and volume control facilitates the SRS-BTV5's use as a speakerphone. A single charge gets about five hours worth of playtime, and the device recharges via a microUSB port hidden beneath an access panel. 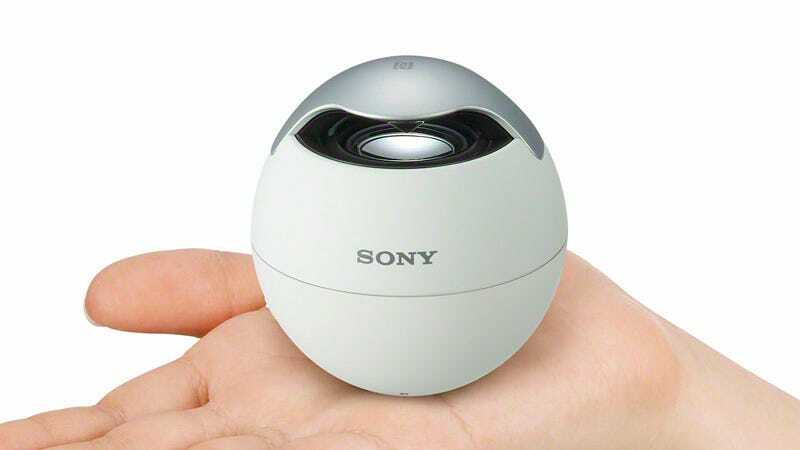 There's no specific pricing or availability details at this time, but presumably Sony will be eventually releasing the minuscule speaker globally after it premieres in Japan.